On an afternoon when Manchester United were thrashed by their nearest rivals, second place in the league was there for the taking... Chelsea however, succumbed to a defeat to Premiership new boys Queens Park Rangers after giving away a penalty, then getting two red cards in the first half. With a sterling second half performance from the nine man Blues, indeed John Terry, Florent Malouda and David Luiz all had chances in the final moments, but QPR managed to hang on, after some time wasting, and the much anticipated final whistle came to bring the biggest giant killing feat of the season (so far). Chelsea came out the strongest and came close with a goal in the opening minute. Didier Drogba Daniel and Sturridge combined fantastically with a neat passing game before Sturridge shot with a tame effort. But just as Chelsea seemed to have everything under control, Luiz bundled Helguson over in the box resulting in an early penalty for Rangers. The penalty seemed to have shook the Blues to their very core, as although they had all the possession and the better of the chances, they just could not get through QPR’s defence. Lampard could have equalised for the away side midway through the first half as he was the recipient of a fine Mata cross, and despite having no one marking him, his shot sailed over the bar to the delight of ‘keeper Kenny. A common theme arose as Chelsea time and time again found their way into the box but failed to capitalise. Right up until the 30 minute mark, the game was end-to-end football. As soon as one club had a shot, their goalkeeper started the attack in the other direction. QPR could definitely count their lucky stars in this game as not only did they get an early penalty, their opponents were then reduced to ten men. Bosingwa’s constant battles with Wright-Phillips hit a dramatic end as Taarabt sent the ball to the latter and Bosingwa clattered him resulting in a direct red card. The home side started doing infinitely better with the extra man on the pitch, but you can never underestimate Chelsea. Meireles had the perfect opportunity to equalise with a 20 yard shot which wasn’t that far away. Just as Chelsea seemed to be getting back into the match, another red card was given. 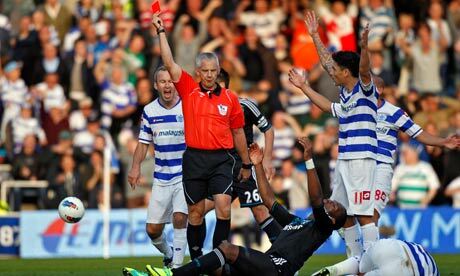 Drogba with a nasty challenge on Taarabt resulted in the second straight red of the first half. Mata seemed to be struggling with a shoulder problem and Anelka came on just before the half time whistle. Chelsea came out from the break looking like a new team of eleven as they quickly took control of the game. Luiz was instrumental as he made some crucial passes as well as getting up front himself. Tempers were flaring though as many booking followed. Mikel was booked for flooring Taarabt and both Lampard and Derry were booked after squaring up to each other for a little pushing and shoving. Chelsea were again all over Rangers and looked the more likely to score. Anelka got passed Hill and found himself in some space, but the beaten defender came back to dispossess him. After a half decent performance, Taarabt was substituted for Smith and he did not look happy. Most of the yellow cards and one of the red cards that were given out were for fouls on him. Ferdinand arguably went in harshly on Lampard but referee Chris Foy gave nothing. Lampard looked furious with the decision and this spilled over in to war of words behind Terry and recent substitute Smith. Chelsea were very lucky not to have a third man sent off after Luiz elbowed Derry but nothing was given. Moments earlier, Luiz had clattered into Helguson from behind but nothing was given then either. A lot of the remaining Chelsea players were starting to let their anger get the better of them as Cole was then booked after a very unprofessional hack at Barton after claims the QPR midfielder had handled the ball were dismissed. As the time ticked away, Chelsea were determined to at least rescue a point. Anelka had their best chance of the half with a header from five yards after Lampard crossed it in but he could only direct his header straight at Rangers’ ‘keeper Kenny. Queens Park Rangers Kenny; Young, Hall, Ferdinand, Hill; Barton (c), Derry (Mackie 81), Faurlin, Wright-Phillips; Helguson, Taarabt (Smith 61). Unused subs Murphy, Orr, Buzsaky, Puncheon, Bothroyd. Chelsea Cech; Bosingwa, David Luiz, Terry (c), Cole; Meireles (Malouda 71), Mikel, Lampard; Sturridge (Ivanovic 35), Drogba, Mata (Anelka 45+1). Unused subs Turnbull, Romeu, McEachran, Kalou.